I frequent the local swap meet most every week in search of treasure. 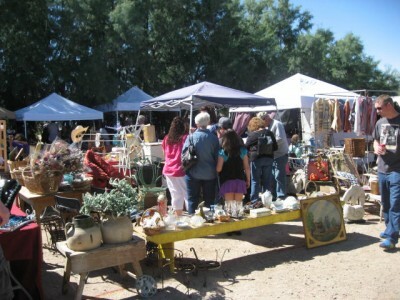 Luckily “treasure” has a different meaning for folks, and even with tons of people there shopping, I always seem to come away with something, either for resale in my antique booth, for my eclectic artwork, or sometimes for my own collections. This week I totally hit the jackpot! 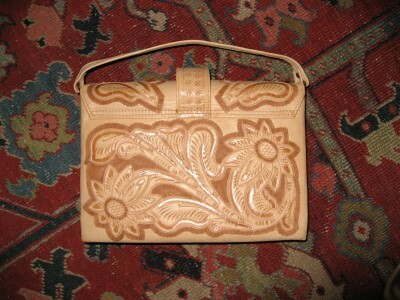 I scored this pristine tooled leather purse for a mere $7! 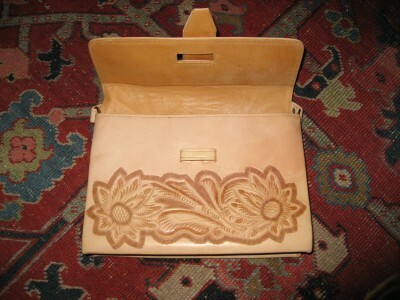 Even with its age and fawn color, it doesn’t have a mark on it, and the leather is soft and supple. Most likely it’s been lovingly packed away for decades. 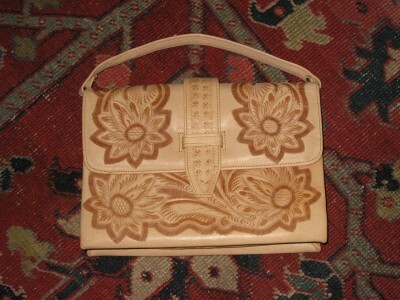 I usually go for crossbody purses, but this is just too darling to part with, no? ~ by admin_aef on May 21, 2013. WHAT? $7? Boy, did you hit the jack pot! That’s one gorgeous bag! It’s beautiful! And pristine – you did get lucky!